Tole of government funding to ensure sustainable technology innovation in agricultural sector. The Evaluation of Agricultural Land as an Investment. The factors affecting of wheat production in Mongolia. Biomass clusters competitive advantage in modern economy. The possibility of producing biomass-based methanol - Hungarian projections. Mapping the objective value function of LP models to support management decisions. A case study about the application of gamification as a tool to improve the employees’ knowledge concerning the strategic plan of a public organization. The use of Akerlof and Kranton’s utility model in higher education. A special application of the learning effect in operations management. A kozmetikumok vásárlására ható trendek bemutatása, különös tekintettel a környezettudatosságra. A filmnézés mint kultúrafogyasztói magatartás elméleti vizsgálata és modellezése. Vásárlói döntéshozatal vizsgálata egy feltörekvő gazdaság élelmiszerpiacán. Az identitás megjelenése a településmarketingben. A társadalmi felelősségvállalás (CSR) és az egészségtudatosság kapcsolatának vizsgálata. A comparative study of Hungarian and Kenyan stock markets. Innovation generating role of the state: new reflexion in historical perspective. Market power of stocks and its impact on market performance: evidence from Budapest Stocks Exchange. Effect of dividend pay out ratio on financial performance of companies listed on the Nairobi Securities Exchange. Investigation on capacity utilization factors of two analytical laboratory instruments acquired from EU funds. The main problems of sustainability financial system in Lithuania. Food Safety Practices Among Older Adults with a Home-Delivered Meal Program. Legume consumption in Hungarian schools. Reduction of food wastage in school catering. Food safety and food allergy - Food handlers’ knowledge. The Influence of Food Environment on Healthy Food Consumption Among Consumers. Food allergy knowledge of foodservice workers in Hungarian school catering. Management Consulting Management Consulting trends, tendencies in Central and Eastern Europe 2000-2018. Stress and its Effects on Employess' Productivity: A Case Study of Barclays Bank, Accra Main Branch. Performance Management in Career Management Perspective. The Importance of Spiritual Leadership and Spirit at Work as Intangible Resource Capabilities in the Service Industry: A Resource Based View Framework. Importance of strategic human resources management in organizational performance. The affect use of information technology to performance police at Human Resources Bureau of South Sulawesi Regional Police. The use of donation to NGO’S as a means of tax avoidance – UN agencies as an example. Using business model canvas to determine the impact of environmental accounting on competitive advantage and financial performance in industrial firms. Introducing International Financial Reporting Standards (IFRS) in accounting syllabus into Vietnam universities. Liquidity, leverage, asset usage effectiveness and financial pressure prediction: The role of profitability. The influence of capital structure on the business companies' performance in the maritime sector. The importance of cost management in moderating the efficiency of a manufacturing enterprise. From passivity to activity and mobility. Social attitudes of the young generation Visegrad Countries towards professional work. The impact of social cohesion on economic and social outcomes. The impact of the organizational culture on the NGO’s leadershiporientation in Syria. Evidence from the Syrian Arab Red CrescentSARC, and the Danish Refugee Council DRC. The Study of the Role of Tourists’ Safety in selected sites in the Central Region of Ghana. The motivation of equestrian tourists in rural areas: A proposed model. Bridges are created to be used - The importance of the contimuous communication in the effective HR-practices. Analysis of health awareness raising through the use of social media applications. Artificial Intelligence: blessing or curse? Forecasting of Stock Market Movements. Comparison of Agile and Traditional Project Management by Simulation: Criteria for Evaluation of the result. Bigdata system using in case of circular economic business model development. Information Management and Corporate Life Cycles. A stochastic simulation of the unmanned aerial vehicels in weed management. Students’ attitude to teaching-learning materials and techniques in online learning environment. The impact of Customers Relationship Management on Customers Satisfaction in the banking industry operated in Palestine North West Bank. The relationship of the mobile phone market players and other macroeconomic variables in Azerbaijan and Hungary. Social media as a tool for the promotion of the philharmonic. The influence of consumer behavior on the development of new services. Lean production application in supply chain management. Examining price volatility along the meat supply chain. Analysis of vegetables and fruits consumption trends in Hungary since the crisis. SMEs supply chain challenges in turbulence markets: Case study of Palestinian SMEs. Designing Business Models: Tools and Applications. Counter-productive behavior and personnel management in small and medium-sized enterprises. Extensive and intensive margin in Hungarian agri-food trade. Market trends and the life cycle. Market study on the economic impact of a "Sunday open for business" in Cologne/Germany. The Relationship Between Some Supplier Service Quality Dimensions and Waste in Supply Chain. Kínai gombavertikum helyzete és fejlesztési lehetőségei. Az afrikai sertéspestis hatása a hazai vadgazdálkodásra. Új kihívások a száraztészta piacon - Hosszútávú versenyképesség elemzése. Budapest és a Mátra térségének összehasonlító vizsgálata a termelői értékesítés szempontjából. Az élelmiszerfogyasztói információ-ellátottság, a bizalom és a fogyasztói magatartás kapcsolatrendszere. Tőkeszerkezeti elméletek érvényesülésének vizsgálata a Nógrád megyei cégeknél. A primer és szekunder szektor finanszírozásának és pénzügyi helyzetének elemzése Magyarország példáján. A magyarországi gazdaságtudományi képzést nyújtó felsőoktatási intézmények összehasonlítása - A felsőoktatási intézmények önköltségszámítási módszertana és nehézségei. A könyvvizsgálat számviteli beszámolók minőségére gyakorolt hatásának elemzése. A KKV szektor finanszírozási stratégiáinak vizsgálata a pénzügyi tudatosság tükrében. Könyvvizsgálati minőségértelmezés és és annak egy lehetséges mérési modellje. .
How does the effect of intellectual leverage shape of the company's profitability. Emotion and motivation in the economic organisations. The hardships of medium and small enterprises: Comparison between the European Union and the African Union. Economics and Entrepreneurship: Review of the Current Approaches. International enterprises cooperation management in the aspect of elimination of base erosion and profit shifting. 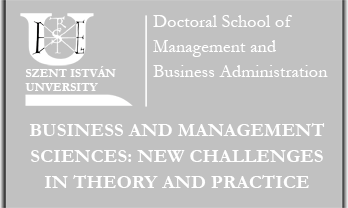 Assessment of development of managerial competences in a business enterprise. 11.00 – 12.00 Session 15: Új trendek, kihívások a vállalati gyakorlatban I. Lean menedzsment módszereinek adaptálása nonprofit szervezetek irányítása során. Az emberi erőforrás menedzsment regionális és hazai sajátosságainak vizsgálata két egymást követő Cranet kutatás tükrében. Néhány empirikus kutatási megközelítés a 2007-ben indult válság kapcsán. Kihívások és válaszok: Munkaerőhiány és digitalizáció a ruházati kiskereskedelmi üzletekben. Magyarország gazdasági helyzetének vizsgálata LAU2-es szinten. 11.00 – 12.00 Session 16: Új trendek, kihívások a vállalati gyakorlatban II. Nemzetközi „Big Data” trendek a vállalati gyakorlatban. Fenntarthatóság és környezetvédelem a klímaváltozás tükrében. Átfogó termelékenységnövelés és minőségfejlesztés lean eszközök komplex alkalmazásával makro és mikro szinten. The Role of Corporate Social Responsibility and sustainability in achieving the corporate goals and their impact on profitability. Collaborative transportation sharing services within the city. Corporate Social Responsibility of SMEs in Slovakia. Corporate social responsibility and sustainable entrepreneurship: The effects and competitive advantages. An empirical analysis on uncertainty tolerance and motivational persistence for female entrepreneurs in Turkey. The Plenary Session and Sessions 1, 2, 4, 5, 6, 7, 8, 9, 10, 11, 14, 17 are in English, Sessions 3, 12, 13, 15, 16 are in Hungarian. Please prepare (ppt) presentation for maximum 10 minutes! For the paper presentation, standard audio-visual devices are available. We ask participants to submit presentations at least 5 minutes before session opening. Szent István University, Doctoral School of Management and Business Administration • 2100 Gödöllő, Páter Károly utca 1.